71-year-old former Marine Rick Hermelin made history this week as the first person to run coast-to-coast on an ElliptiGO elliptical bicycle. The intrepid septuagenarian made the epic 3,000-mile trek to raise funds for the Injured Marine Semper Fi Fund , a non-profit set up to provide support for injured and critically ill members of the U.S. Armed Forces and their families. Hermelin began his transcontinental journey on March 23, 2012 at the Marine Corps Recruit Depot in Parris Island, South Carolina and finished his fundraising run in exactly 100 days at the Marine Corps Recruit Depot in San Diego, California on June 30, 2012. With the goal of raising $10,000 for the Semper Fi Fund, Hermelin made the crossing self-supported, carrying only a small backpack. His mission quickly captured the hearts of the people he met along the way. Families opened up their homes to him, restaurant owners fed him free of charge and a network of fire departments hosted him for 53 nights. In the end, Rick exceeded his fundraising goal and as of July 3, 2012, he had raised $11,462 for the Semper Fi Fund. Hermelin served in the Marine Corps from 1959 to 1963 as an Aviation Communications Technician, but it wasn’t until later in life that he developed his love of running. Over the course of 35 years, from 1976 to 2011, he completed 100 marathons, 100 half-marathons, and 100 10K races. Having reached this incredible milestone in June 2011, he started looking for a new challenge. “I had thought about running across the U.S. before,” said Hermelin, “but I wasn’t sure if my body would hold up for the entire journey. 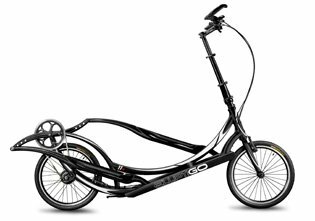 Plus, it would take me about 6 months.” That’s when one of his clients suggested he try out the ElliptiGO bike as an alternative. Designed by runners, the ElliptiGO elliptical bike is the first outdoor, low-impact, fitness device specifically designed to emulate the running motion. It allows athletes of all levels to get a high-intensity workout without experiencing the repetitive impact of running. Healthy athletes and injured athletes alike have found it the most effective way to get an outdoor running experience without the usual pounding on their bodies. Total number of flat tires: One! “I’m happy to report that both the ElliptiGO bike and I made it across the country with all original parts in good working order,” Hermelin added. The Injured Marine Semper Fi Fund is a 501(c)(3) nonprofit that directs urgently needed resources to post 9-11 Marines and sailors, as well as members of the Army, Air Force or Coast Guard who serve in support of Marine forces. The Semper Fi Fund provides relief for financial needs that arise during hospitalization and recovery, as well as assistance for those with perpetuating needs. Since establishing this fund in 2004, they have issued more than 38,000 grants totaling more than $57 million to thousands of Marines and their families.